Various restaurants have various reservation policies for various reasons. We thank you for understanding ours. Gale Street Inn takes a limited number of reservations each and every night. We do not overbook our restaurant. We seat 98% of our reservations on time, every time. 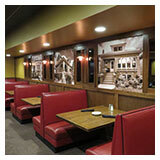 If our restaurant is busy at any time and on any night, we may ask that your party be complete before we seat you. This ensures a positive outcome for not only us, but for all of our guests, including those without reservations. During the week, Wednesday and Thursday, we take reservations for parties of any size. This may not apply on holidays or theme nights. Due to the popularity of our restaurant on weekends, we take reservations for parties of six or more, again on a limited basis. Please contact us at 773-725-1300 and we will do our best to accommodate you. Christmas Day, Easter Sunday, Memorial Day, Independence Day, Labor Day & Thanksgiving.